In most of the cases, the simplest things are the best answers in the end, don’t you think so? Same thing is for refashions (at least with my limited skills hehe :)). Immediately after I got home I got to work because it were small refashions. 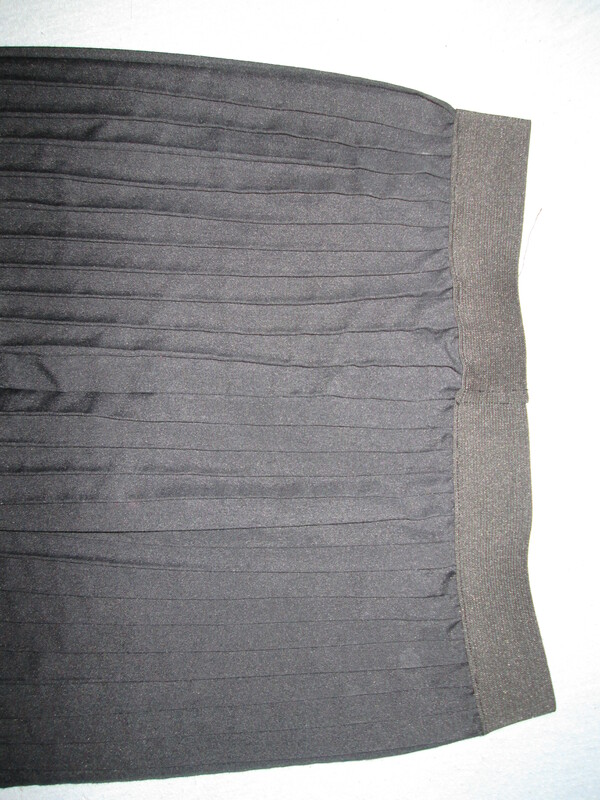 I meant to hem it from the bottom, but then I saw two holes and I had to do it from the top part. I made two casing, pulled through two thin elastics and done. I had some trouble deciding what to do with this one. 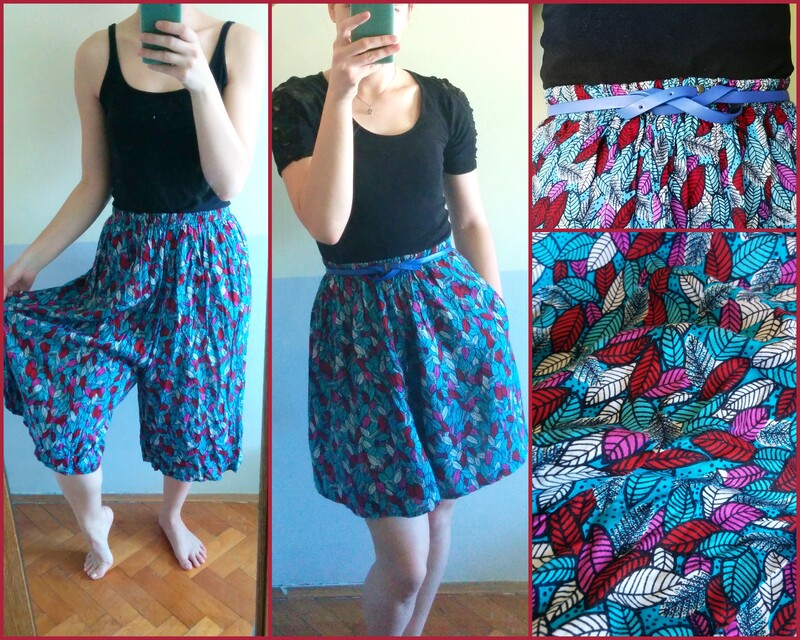 These were some kind of big shorts and my first instinct was to just simply unpick the legs, sew it to a skirt and hem it. 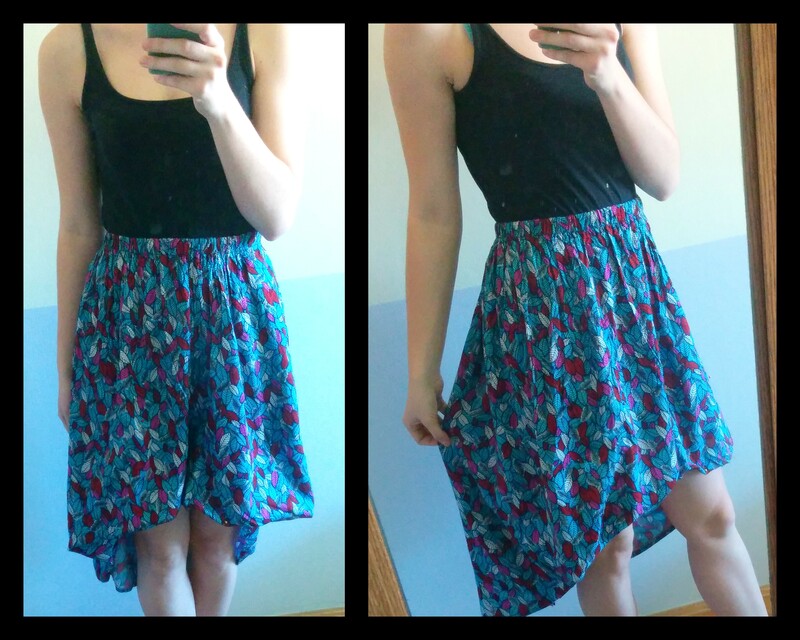 But then I got the idea of a waterfall skirt. Something like this (pic is not a finish product, it is just pinned around). Pants weren’t really nice, were they? The T-shirt is also thrifted (less then a dollar). It is a nice simple T-shirt with lace panels in the sleeves (sorry, didn’t take pictures of it). Hope you’re having a nice Sunday! Two days and two broken needles later, it’s finished! How can something so simple give me so much trouble?! Aaarg! 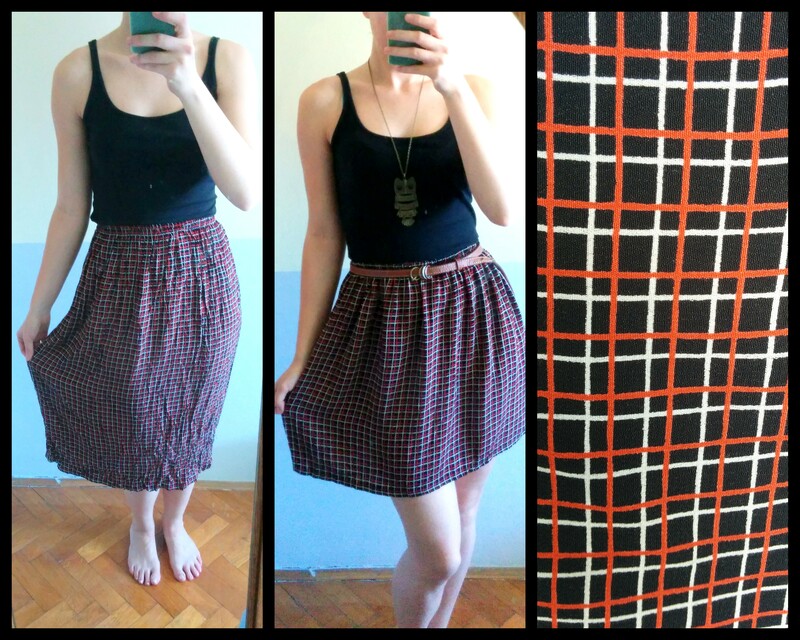 I got this skirt while thrifting some time ago. It was this, some leopard moo moo like dress and a scarf for I think a dollar or 1.80 $. 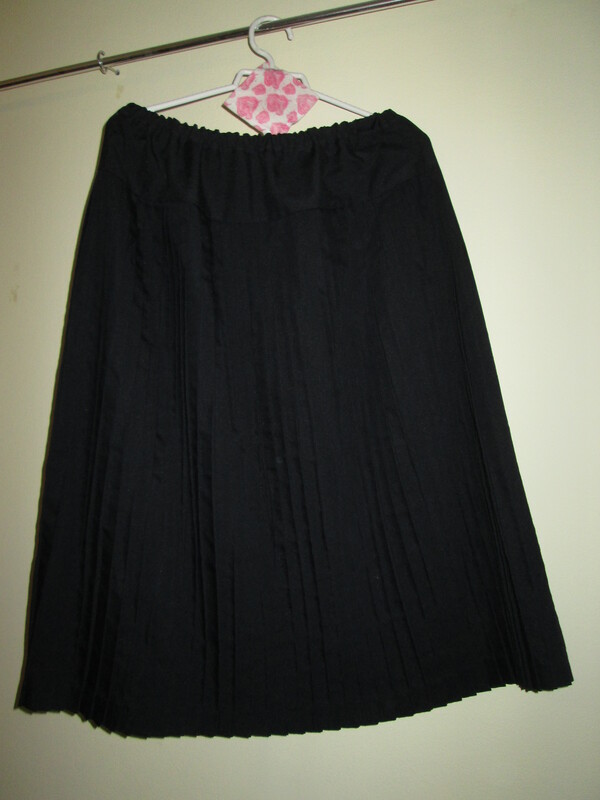 I liked the pleats instantly! But when I put it on it was weird. It was baggy at the hips and made them look wider (and mine are wide enough ;)). 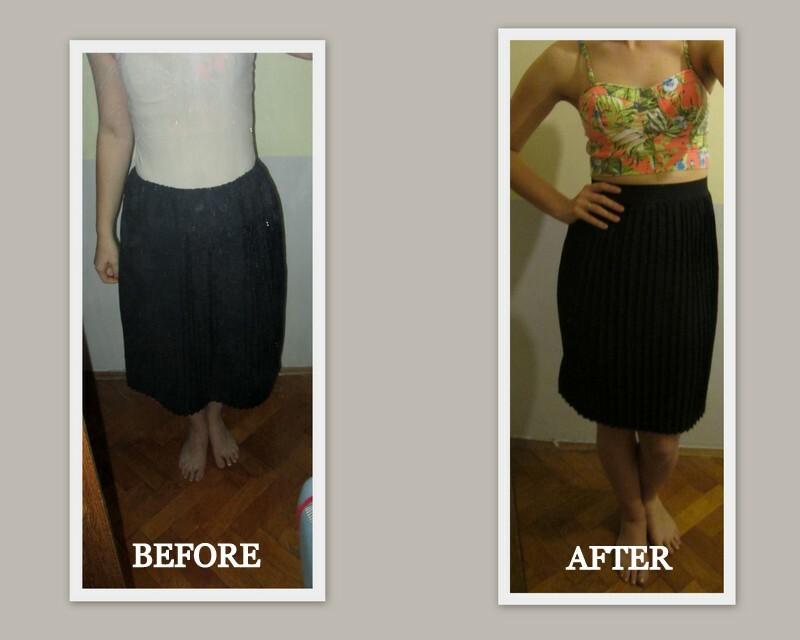 I read the tutorials on how to make waist elastic skirt and it seemed easy enough. Boy, was I wrong! It is very different to sew with gathered fabric and with pleats! Much more frustrating! As you can see in the picture down some look good, but while I was getting to the end of elastic I had to spread them. I did learn it’s very important to stretch the elastic from both sides. There’s that at least. I think it will look good with a simple T-shirt for work and in my free time I’ll definitely pair it with the cropped top above! Really like how it looks! 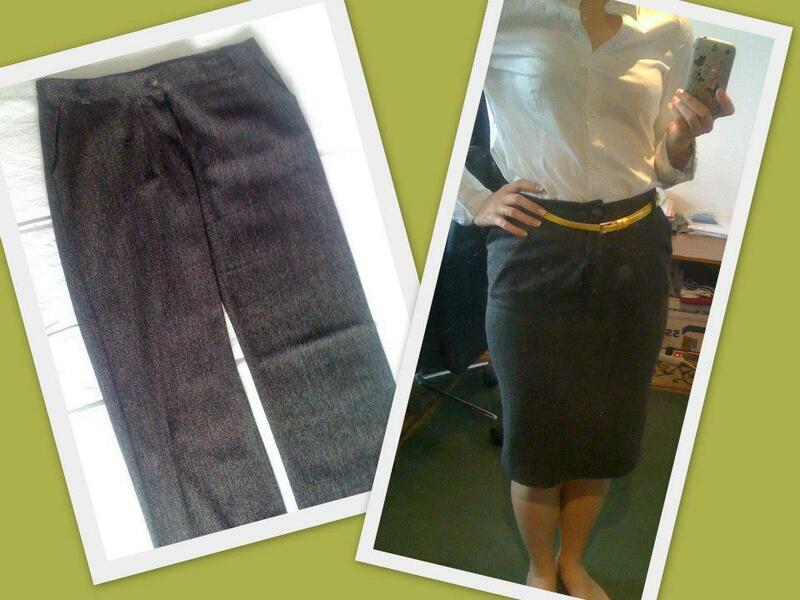 If anyone could give me some tips please on what to do next time, how to work with pleats I would be sooo grateful! I bet everyone has got an old pair of jeans or trousers that they don’t wear anymore, so this is a great way to start wearing them again. Just turn them into a nice pencil skirt! Here is a tutorial I followed. Takes about 15 minutes. If you want to wear it more on your waist like I do you’ll just need to take in at the sides of the waist.